Did you know that marine foam cushions can act as a flotation device in addition to being a comfortable place to park yourself? In fact, foam is a major component to safety on a boat. With summer just on the horizon (time flies so fast), it’s important to make sure your ocean cruiser is armed with the tools you need to keep friends and family safe. Boat cushions are easy to make on your own. It’s recommended you use some water-resistant fabrics to keep the insides dry, but dry fast foam will help cut down on mildew and residual moisture. You will need to measure out a simple square to match any benches or seating on your boat, then order a custom-cut piece fit to those specifications. Don’t worry. Ordering foam wholesale is actually one of the most affordable met hods you can use to give your boat a face lift. Otherwise, you’ll pay a premium for ready-made cushions you will probably need to replace in a year anyway. 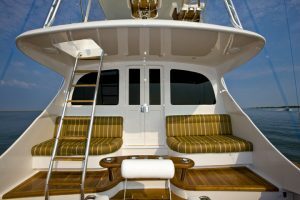 Yacht cushions can be especially expensive after markups, so doing it yourself is the path of least financial loss. If you can, it’s a good idea to sew some canvas straps to your flotation cushions. These straps will become important handholds for anyone who goes overboard. Hanging on to that cushion could be the single action that saves someone’s life. As for sun damage, stowing them below deck will offer the greatest amount of long-term protection. Still, sun bleaching is common so you may need to replace the covers every year or two.